A study from the University of Alberta and Environment and Climate Change Canada found that bears now take 115 swims longer than 20 miles in length, 100 of them in the Beaufort sea, where there is a more varied climate. Biologist Andrew Derocher of the University of Alberta spent six years studying over 100 polar bears living off the northern coasts of Alaska and Canada, according to The Washington Post. He observed one young polar bear that swam 250 miles of the Beaufort Sea in 2009, going nine days without food or rest just to find a piece of ice to fit her entire body on. Three years later, 69 percent of the bears Derocher monitored swam at least 31 miles to find ice compared to 25 percent in 2004. Derocher ultimately concluded polar bears were making longer journeys depending on how much ice was lost in their habitats. Ice is changing so quickly that we’re finding the bears are getting caught in places where they’re finally coming to the realization, ‘I just can’t stay here.’ These kinds of long-distance swims are not what they evolved to undergo. Such swims can prove fatal for cubs, who risk hypothermia while their parents lose dangerous amounts of weight. A mother bear lost 22 percent of her body weight and saw her 1-year-old cub die during a nine-day journey in 2009. Polar bears use slabs of ice in the middle of the sea as platforms to dive for prey. The Beaufort Sea had a surplus of ice in the 1980s, but satellite images taken earlier this month revealed ice in the Beaufort Sea above Alaska and the Yukon is beginning to break apart. None of this is what I would call a smoking gun as to what is happening with polar bear abundance, but the signs are all pointing in the same direction.We’re seeing bears with lower body fat, fewer cubs, changing hunting behavior. 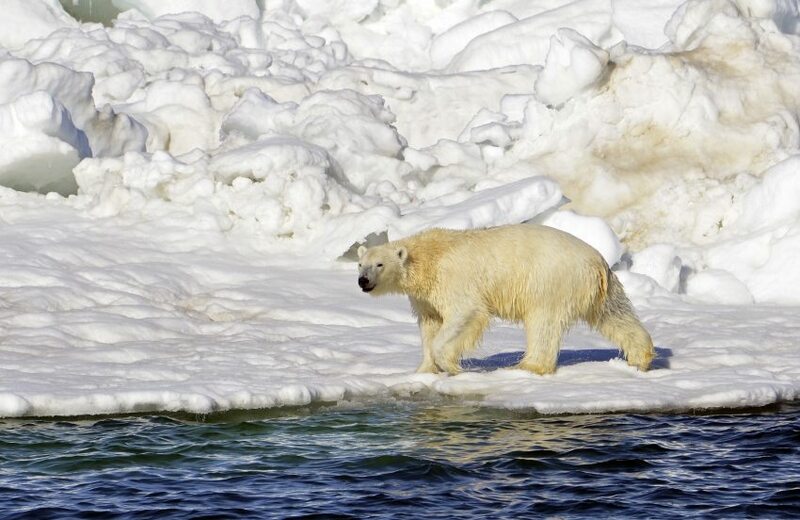 From 2001 to 2010, the polar bear population in the southern Beaufort Sea dropped between 25 and 50 percent, a 2014 study found. By the middle of this century, Derocher predicts the entire population of polar bears living in the Beaufort region will be completely wiped out. These bears must mimic those of the Hudson Bay and learn to hunt on land during the summer in order to survive, though it’s unclear if this is even a possibility. In March, two climate change experts released a study warning the entire West Antarctica ice sheet could melt by the year 2100. Such an event would add several feet to the sea level and put coastal cities around the world at risk of drowning.